Bülent Ortaçgil (° 1950, Ankara) stated playing the guitar at an early age in several groups.During his high school years he was hugely influenced by music by The Beatles, Bob Dylan and Cat Stevens who, at that time where a hit in Turkey as well. In 1974 he releases his first album "Benimle Oynar Mısın" .The album becomes a great success and one of the biggest classics in Turkish music history. A lot of music from this album has been used for years for various films and TV-programs. 2000 saw the release of the album “Bülent Ortaçgil İçin Söylenmiş Bülent Ortaçgil Şarkıları", a tribue on which some twenty Turkish artists and band cooperated, and in adition about the first and only distinguished tribute-album which was produced in Turkey for a living artist. His (temporarily) last album “Sen” appeared in 2010. In 2013 he already was on our stage in De Centrale, together with Erkan Oğur. Tonight he performs with his band. 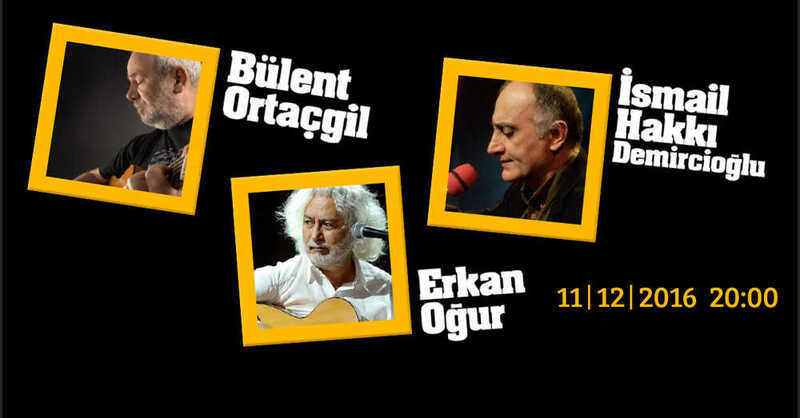 It is the third time that Erkan Oğur and İsmail Hakkı Demircioğlu,both absolute masters of the Turkish string instrument, share a stage in Ghent(a first time in 1998 in the former Burgcentrum and a second time in 2008 in De Centrale). 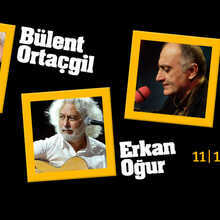 The talent of the 61 year old Erkan Oğur reaches from the classical music of Anatolia to American blues. Erkan Oğur plays bağlama, kopuz( a fretless string instrument originally from Central-Asia) and his own self-designed fretless 8 stringed accoustic guitar on which he can play the entire Turkish music system( compare it with the equally fretless ud – much better suited for the complex Eastern music system – with its makams and quarter tones).Besides he is also known for his freestyle interpretations of Turkish classic songs and folk. As a composer,he also scored soundtracks for award winning Turkish movies, like Eşkıya (1996) en Yazı Tura (2004). İsmail Hakkı Demircioğlu was born in 1957 in Rezie, in the Turkish Black Sea region. He was predestined for a musical career and after he graduated at the Consevatory from the Istanbul Technical University , he continued to specialize in everything that had strings, to eventually return to his first great love, the bağlama. Demircioğlu and Oğur have been playing together since 1998.The duo still regularly perform live. They also made two albums together : Gülün Kokusu Vardı and Anadolu Beşik.